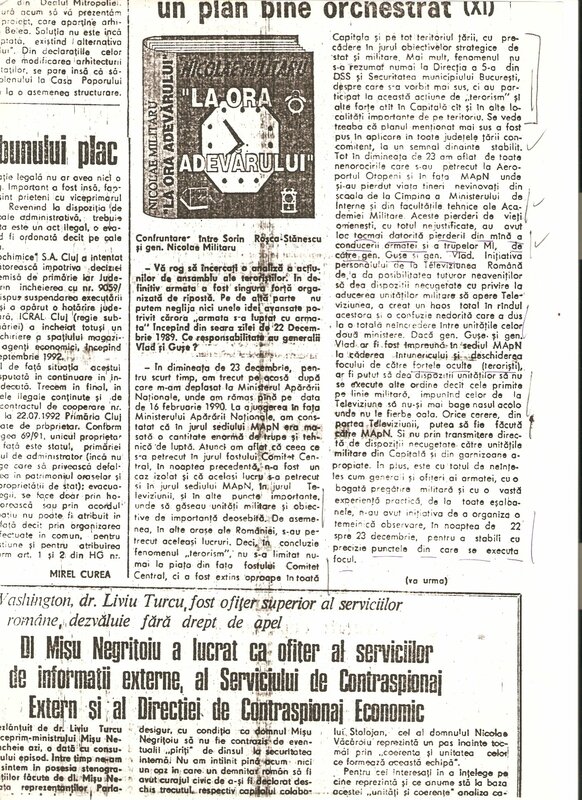 Confruntare intre Sorin Rosca-Stanescu si Generalul Nicolae Militaru, Evenimentul Zilei, nr. 160 5 ianuarie 1993 (?). (VIII) Teroristii se plimba printre noi, iar unii au ajuns milionari, Evenimentul Zilei, nr. 167 (13 ianuarie 1993). (XI) Teroristii au lucrat dupa un plan bine orchestrat (? 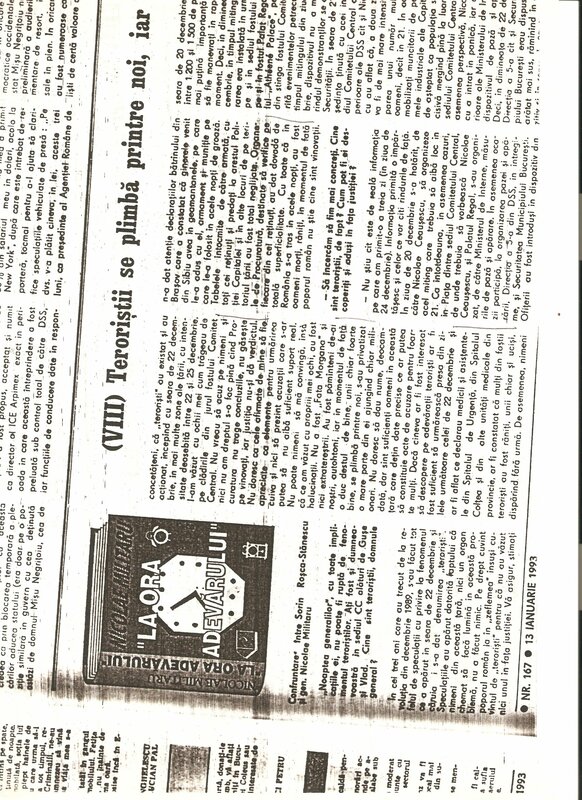 ), Evenimentul Zilei, nr. 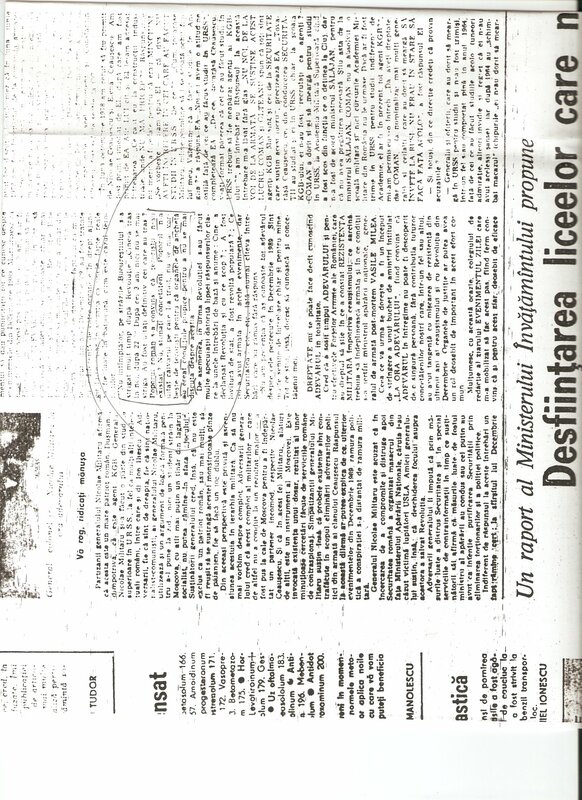 168 (14 ianuarie 1993), p. 3. 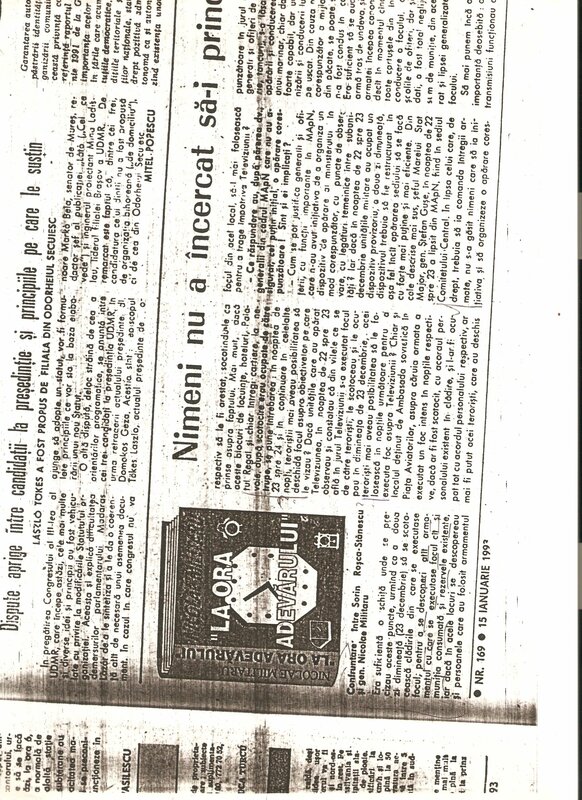 (XII) Nimeni nu a incercat sa-i prinda pe teroristi, Evenimentul Zilei, nr. 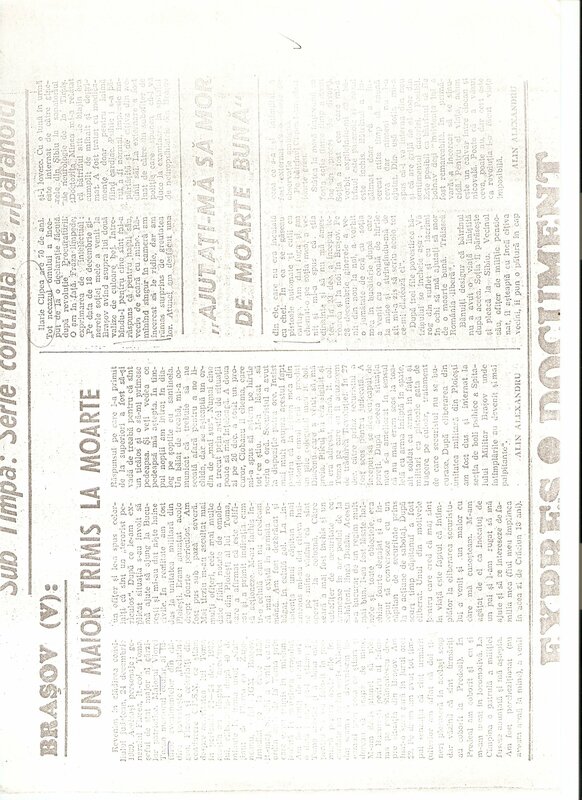 169 (15 ianuarie 1993), p. 3. This entry was posted on June 11, 2011 at 12:30 pm	and is filed under decembrie 1989, raport final, Uncategorized. 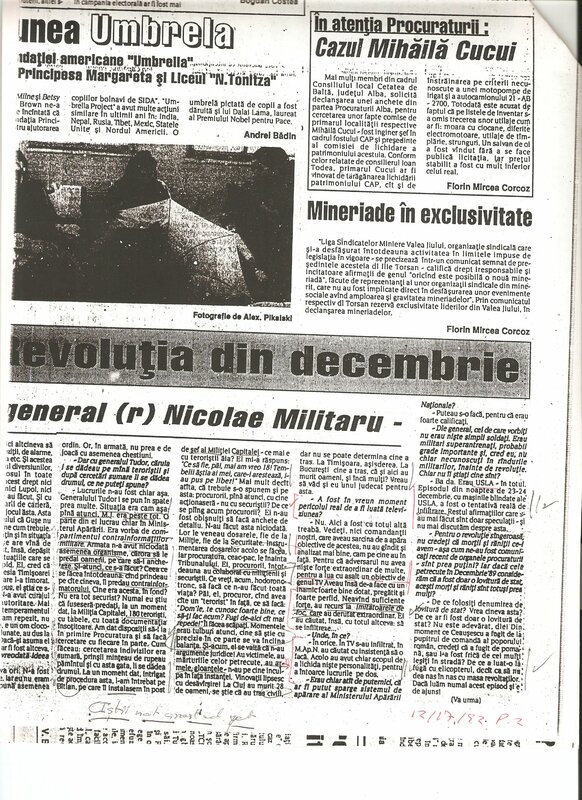 Tagged: Dosarele Revolutiei, Evenimentul Zilei 1993, Nicolae Militaru, sorin rosca stanescu, teroristii decembrie 1989. You can follow any responses to this entry through the RSS 2.0 feed. You can leave a response, or trackback from your own site. During the Cold War, the days of 12 to 19 December 1988 Seymour D. Reich President General Conference of Presidents of Jewish Organizations of Great American, had secret talks in Moscow with Soviet authorities. Meeting to aim a new territorial division and control planetary political, military, economic and social planet. Changes that will begin to happen after a meeting between Pope Paul II and Bush after the meeting in Malta, between Bush and Gorbachev. In 1992, William B. Wood, chief geographer of the U.S. State Department was the U.S. ambassador in Afghanistan gave the public a map with new borders of European states, which would have changed under the strategic interests of the fall of the communist bloc, according to with the understanding of Malta. Subsequently, these conversations public focused on foreign affairs, culture and religions, ending with certain agreements, which did exactly the same moment that the U.S. State Department declare that it “agrees” to be held in Moscow World Conference on Human Rights. 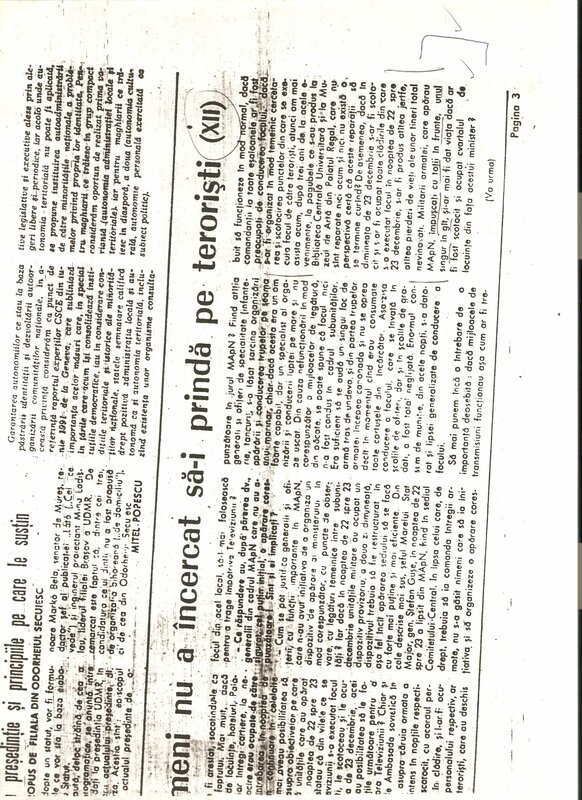 In this conference are attacked Ceausescu and Romania by the Soviet Union, America and NATO allies condemned Romania for the foreign debt to IMF and World Bank and refusing to cooperate with such organizations and does not respect human rights with the rights granted Hungarian minority and autonomy for Hungarians in Romania and failure to start the action and street demonstrations in America and throughout Europe (as did other day protest at the Romanian Embassy in Hungary) of the Hungarian refugees against Romania at all embassies accredited abroad ROMANIA . League for Human Rights, Journalists Without Borders and the Red Cross are soldiers serving the UN, NATO, Soros, the IMF and members of the CIA, Mossad, M16 and others dressed in civilian clothes and military map of the attack, but no degrees and military insignia Are armed with weapons and shoot civilians and NATO troops destabilitate to create social, economic and political. Who does not think to look at Libya in 2011. 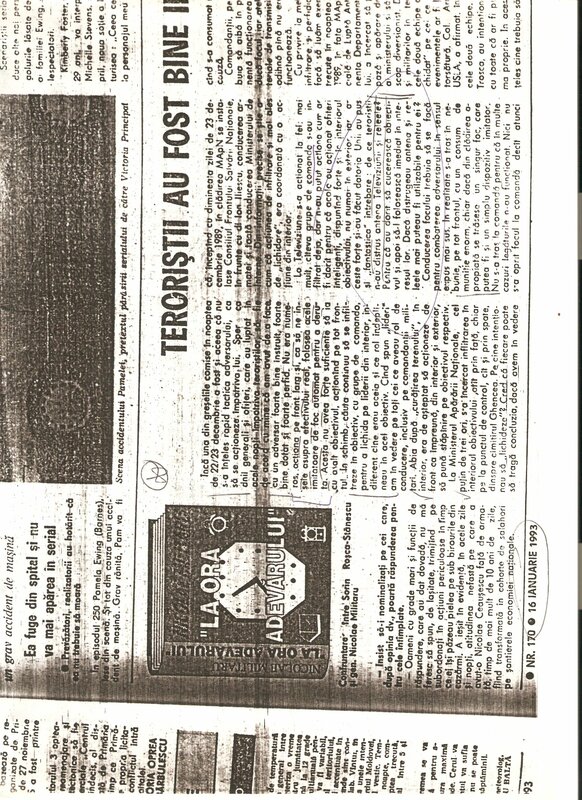 L’Humanité newspaper gave the story of 20 January 1989 meeting in Moscow of the Trilateral Commission delegation, headed by Jews Soros, Rockefeller and Kissinger, French president Valery Giscard diEstaing Yasuhiro Nakasone of Japan and the Soviet authorities and represented the peak of Gorbachev and Primakov noted that as a supporter of the territorial division of the entire planet and political control, military, economic and social planetary by America and Russia (to believe Primakov), through NATO, UN, EU, Soros, the IMF and others. February 2, 1989 King Michael of exile in Geneva, addressed the UN and ask the military to attack Romania, citing human rights, that does not respect human rights to the Hungarian minority with the rights granted and does not grant autonomy to the Hungarian minority Hungarians in Romania. 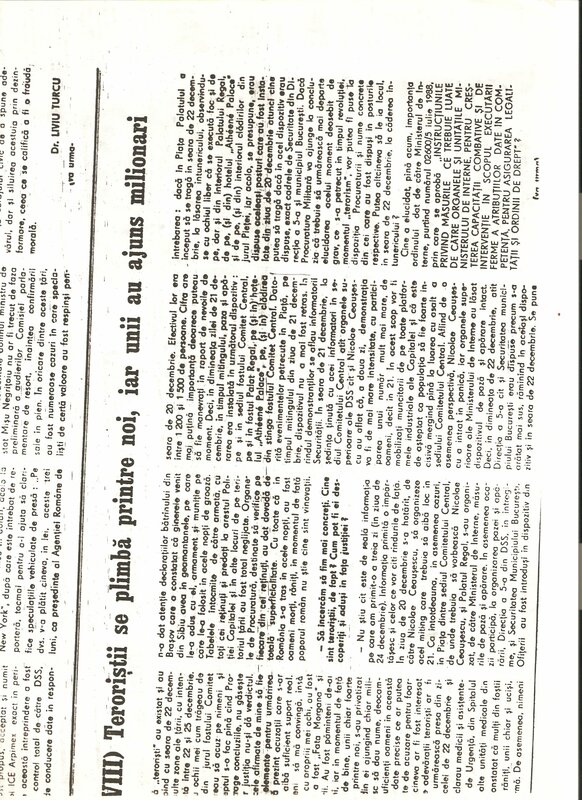 In reality, King Michael of Romania wants military attack to recover property transferred by the Jews willingly komiternisti Bolsheviks: LEONTE Tismaneanu WALTER Neulander, Dionys PATAPIEVICI and other, that King Michael has also brought to power in August 23, 1944 and for which arrested and killed the marshal Antonescu and was awarded the Truman-Stalin-US and Russia and that he gave a commission UNCONDITIONAL Romania to Russia, U.S. and UK, and is guest of honor at the demonstrations taking place May 9 in Moscow over 60 years. 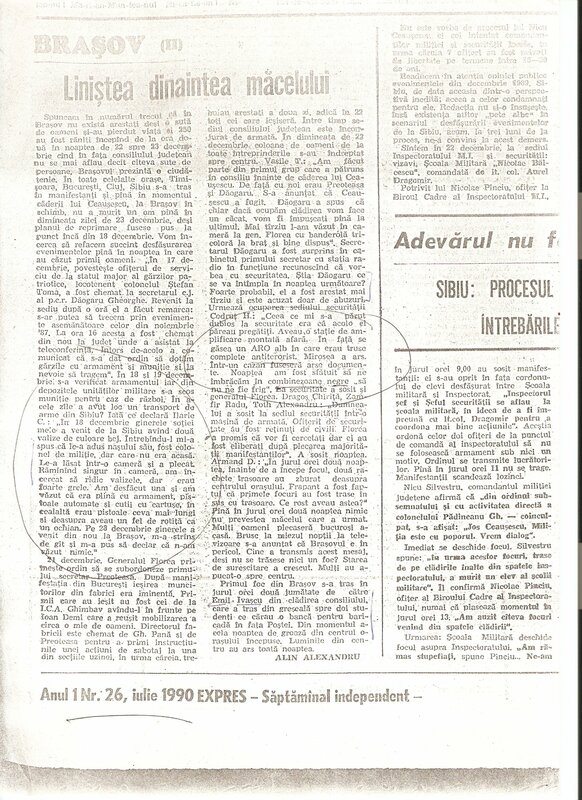 King Michael is a member of B’nai B’rith lodge, and the request addressed to UN military attack romania is rejected, as there is a resolution and in this respect than the UN did not challenge a resolution even more, Michael attack Romania to the UN for refusing to grant rights to Hungarian minorities in Romania and Transylvania in Romania refused establishment of the Republic. 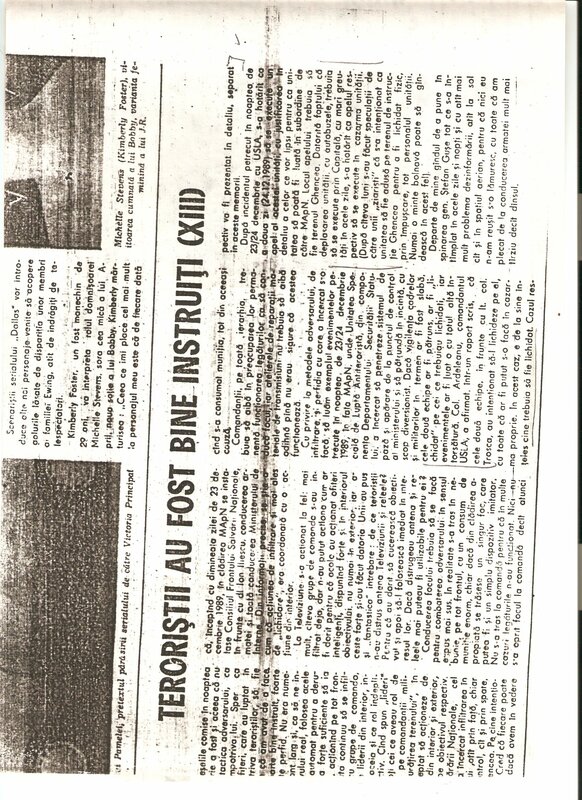 So, Dumitru Mazilu’s report appeared to address the UN in Geneva, which was passed Mircea Dinescu and personally handed it to Stroke Coenraad Frederik 1988 – 1993 Ambassador of the Netherlands in Bucharest, which brought the diplomatic courier Netherlands Embassy in secret BUCHAREST. Trilateral Commission March 6, 1989 the shareholders of the IMF ordered the foreign ministers of member Conference on Security and Cooperation in Europe (CSCE) in Vienna to meet opening of negotiations between the Army Conventional Force in Europe (CFE) of the 23 NATO and the Warsaw Treaty Organization on confidence and security building measures and dismantling for pluralism in Eastern Europe, Soros -IMF that can control the military, economic and finance and the Eastern European countries. Wrong, in every sense of the word! Wrong!